I am a mom of three girls I have an 8 year old and twin 10 year olds. This year I was going to just recycle old costumes but unfortunately one of the twins was unable to fit in a skirt for one if the costumes. So we got to talking and not sure if it was her idea or mine (I will give her the credit since I am a great Mom) but we decided okay let’s do a shower time theme costume and not spend a lot of money doing it. Ended up being around $30. 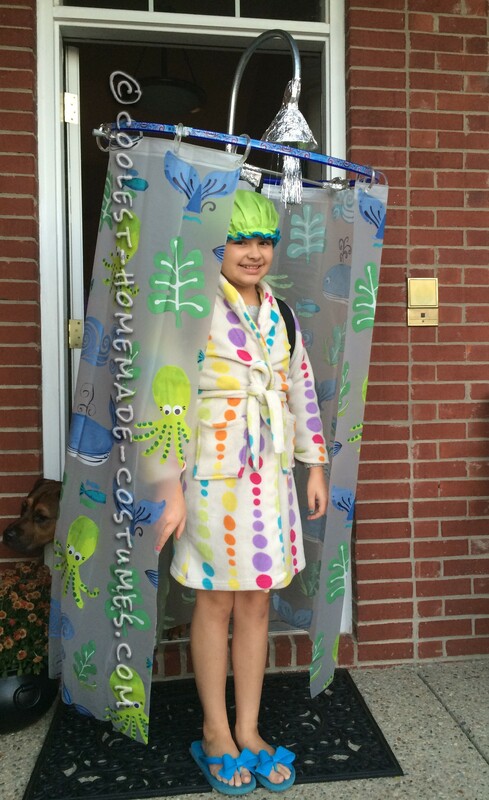 With only our imagination and a few items we were able to create the shower curtain costume. Although without her Dad’s engineering prowess and free metal pipe we would not have been as successful!! Whats holding the hula hoop up?